“Over the years, the Lumières and Méliès have been consistently portrayed as opposites—the idea is that one filmed reality and the other created special effects. Of course this kind of distinction is made all the time—it’s a way of simplifying history. But in essence they were both heading in the same direction, just taking different roads—they were taking reality and interpreting it, reshaping it, and trying to find meaning in it.” In The New York Review Martin Scorsese offers a slightly modified version of his marvelous Jefferson Lecture of a few months back, roaming through cinema’s history to make an argument for its centrality in terms both catholic (“We have to look beyond the officially honored, recognized, and enshrined, and preserve everything systematically.”) and Catholic (“First of all, there’s light.”). Béla Tarr’s Film Factory, the three-year workshop currently running at the Sarajevo Film Academy, was greeted with some confusion when it was announced; was this an academic program, a workshop, the director’s own private folly? After his stint as a guest lecturer, which overlapped with two “remarkable classes” by Tilda Swinton on the Bressonian nature of acting and a four-and-a-half hour “shot by shot and take by take” analysis of Sátántangó by Tarr himself, Jonathan Rosenbaum has another definition: utopian community. From the study of film to films that study themselves: also at Sight & Sound, Kevin B. Lee examines the essay film, arguing against the limitations some would place on the form in both text and an accompanying video essay. Both are as thought-provoking and wide-ranging as you’d expect from Lee; Indiewire’s Sam Adams can help you out on the latter, rounding up the movies referenced in Lee’s video, a tour of images ranging from Ivens’s Valparaiso to Andersen’s L.A.
“Cinema has become much more conservative than it was 80 years ago. Character, space, and speech were an organized entity that was fused together and you didn’t have to explain or apologize for it. And now you have to talk about it in some discourse that was resolved 80 years ago! Take Vertov, take Eisenstein—this was popular cinema at the time. Now we have to explain why narrative cinema can work not necessarily through dialogue, how bodies can speak.” The new issue of feminist film journal cléo (spotted by Matt Singer) kicks off with a terrific interview with Attenberg director Athina Rachel Tsangari, where she explodes the reductive notions of both women’s and national cinema. Elsewhere in the issue, Mallory Andrews examines the class privilege that keeps Haynes’s Safe from being a simple tale of empowerment, Tina Hassannina looks at Vagabond’s and Wendy and Lucy’s distinct views of female homelessness, and Lindsay Jensen unpacks what’s going on with Oblivion’s odd notions of maternity and romantic partnerships. Christopher Kelly traces the ten-year journey of David Lowery from self-financed films he still withholds from distribution to overnight success with Ain’t Them Bodies Saints; and how the Dallas film community has grown along with him. Via Movie City News. 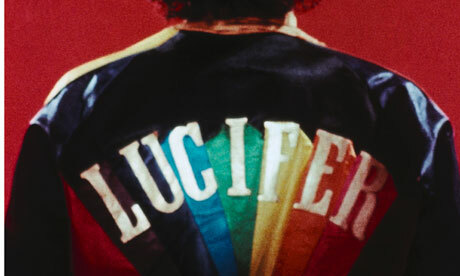 There’s something absolutely perfect about the fact that Kenneth Anger’s account of the making of Lucifer Rising, as relayed to Chris Michael, is nothing of the sort, but rather a semi-coherent ramble that name-drops his every collaborator only to swipe at them with gossipy asides. Hudson also spots that The New Republic has posted their original review of The Big Sleep, proving Manny Farber’s first impressions (“witty and sinister, and in an odd way…a realistic portrayal of big-city life with Arabian Nights overtones”) are richer than most critics’ third or fourth. “I have a fondness for almost all Greek things.” “As an almost all-Greek thing, I’m flattered.” Michael Wood finds Cleopatra neither as good as it strives to be nor as bad as its reputation suggests; though it has aged uncomfortably in some ways, most concerning Richard Burton. Luke McKernan’s upcoming book “Charles Urban: Pioneering the Non-Fiction Film in Britain and America, 1897-1925” chronicles the inventive producer and filmmaker who constantly wed a nose for technical innovations with an idealistic urge to put cinema not just in the theaters, but the hands and homes of every viewer: “‘We put the world before you’ was his proud boast.” As prelude, McKernan offers an overview at one of his websites (and also maintains another dedicated to Urban for those wanting a deeper look). “Casting is always terrifying because you’re always opening yourself up to the heavens and say, ‘Please give me a miracle.’ I’ve been very lucky to have had those miracles delivered when I needed them and I wish I could figure out how do that in the rest of my life.” Jonathan Marlow interviews Computer Chess director Andrew Bujalski and star Robin Schwartz on filming in Austin, and the ironies of a project taken up as “something of a lark” set to become the filmmaker’s most popular film yet. Also at Fandor, cinematographer Benoît Delhomme explains to Anthony Kaufman some of the challenges he faced recreating the Vietnamese outdoors on The Scent of Green Papaya’s soundstage. “Graffiti kills the possibility to go back in time and have the buildings be as they were. Cheap storm windows and graffiti have ruined the world for Ronnie Rocket.” David Lynch’s interview with BOMB’s Michael Saur offers a familiar but still engaging runthrough of the artist’s obsessions—TM, the need for final cut—and since he’s a musician now, throws in a Jerry Lee Lewis reference as well. Brandon Schaefer offers a gallery of Woody Allen posters whose unflashy monochromatic presentation he’s come to admire as conveying their subject’s personal style (and a few eastern European prints that missed the “keep it low key” memo). While Arthur Schatz’s photo shoot of Allen, done for Life in 1967, finds the young comedian as photogenically unphotogenic as always; and so charmingly domestic with Louise Lasser you’d think he makes the perfect companion. Kimberly Lindbergs’s gallery of ads featuring Barbara Stanwyck has the greatest actress of her time shilling for laundry soap, RC Cola, and wallpaper, and making each seem a fabulous accessory. Video: “He makes my heart a CinemaScope screen/Showing the dancing bird of paradise” It’s not Hitchcock/Herrmann or Cronenberg/Shore, but Paul Thomas Anderson has returned to collaborating with Fiona Apple, directing the stylish video for her song “Hot Knife”. Vulture has this plus the previous four they shot together. You might call Bernadette Lafont the first muse of the Nouvelle Vague. She starred in François Truffaut’s first short “Les Mistons” and Claude Chabrol’s debut feature Le Beau Serge (1958) as well as A double tour (1959) and Les bonnes femmes (1960), and went on to appear (among many others( in Nelly Kaplan’s A Very Curious Girl (1969), Jacques Rivette’s Out 1 (1971), Jean Eustache’s The Mother and the Whore (1973), and Claude Miller’s L’Effrontee (1985), for which she won the César. She passed this week at the age of 74. More from Ronald Bergan at The Guardian. Dennis Farina was a veteran Chicago cop when Michael Mann cast him as a thug in Thief (1981), launching an acting career that lasted more than 30 years. Mann brought him back from numerous films and gave him the lead in his TV series Crime Story, and his career includes memorable roles in Midnight Run (1988), Get Shorty (1995), Out of Sight (1998), two years on the police procedural warhouse Law and Order, and back with Michael Mann in his acclaimed HBO series Luck. He died at age 69 of a blood clot in the lung. Adam Bernstein at The Washington Post. The “Hitchcock 9” collection, restored editions of the surviving silent films directed by Alfred Hitchcock, plays at SIFF Cinema Uptown this weekend. Each film plays only once so plan carefully: this may be your only chance to see Hitchcock’s silent movies on the big screen. All but one are accompanied with live music. The Lodger will feature a recorded score. More at SIFF Cinema website. Also note the follow-up series Hitchcock’s UK Masterpieces, presenting eight British sound films playing Monday through Friday.